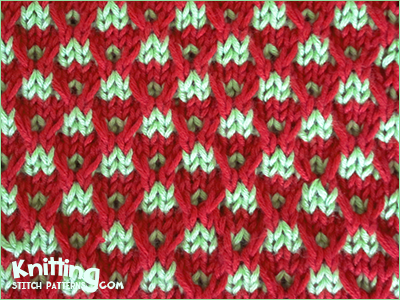 With color A, cast on a multiple of 6 sts and knit two rows stockinette stitch (knit the RS row, purl the WS row). Row 3: With color A, k1, * c2b, c2f, k2; repeat from * to last 5 sts, c2b, c2f, k1. Row 4: With color A, purl all sts. Row 5: With color B, k5, * sl 2 wyib, k4; repeat from * to last st, k1. Row 6: With color B, p5, * sl 2 wyif, p4; repeat from * to last st, p1. Row 8: With color A, purl all sts. K: Knit | P: Purl | Sl: Slip stitch as if to purl. Wyib: With yarn in back | With yarn in front: Wyif. The first way: Slip next st onto cable needle and hold at back of work, knit next st from left-hand needle, then knit st from cable needle. The first way: Slip 1 stitch onto cable needle and hold in front, knit next st from left-hand needle, then knit st from cable needle. The second way: Skip 1 stitch and insert needle from back to front between lst and 2nd stitches and knit into the front 2nd stitch, leave on needle; then knit the skipped stitch, slip both stitches from the needle together.